More about iittala Toikka Harvest Puffball 2016 Annual Bird Only in production for the year, the 2016 annual bird makes a great gift for collectors and is a must-have for your own flock of the Finnish art pieces. She is the bigger sister to the popular puffball series but with two tones instead of one. Coated in a rich caramel color, the opal base is contrasted by a highly reflective chest and head. 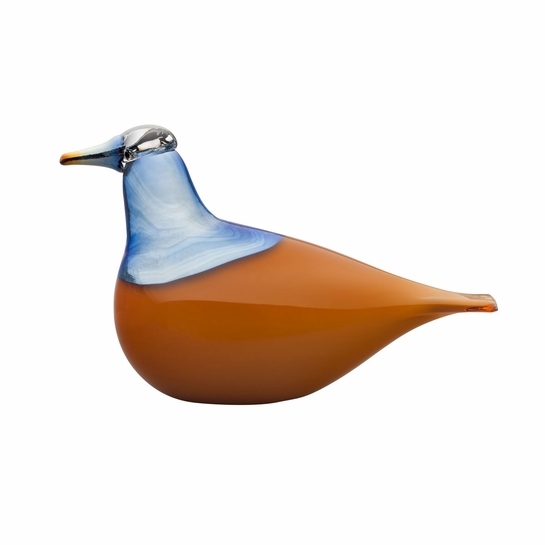 Her stunning coloring is an ode to autumnal grain fields, designed by Oiva Toikka and handcrafted by the glass blowers at iittala's works in Finland.The birds of Oiva Toikka's 2016 collection are individually mouth-blown by the master glassblowers at iittala�s glassworks in Finland. With production limited to only one year, each handcrafted iittala Toikka Harvest Puffball carries the signature �O. Toikka IITTALA 2016� on its base to ensure authenticity.